Change comes slowly to the subway. Signs hang for decades. Trains are rarely replaced. A new line can take centuries. 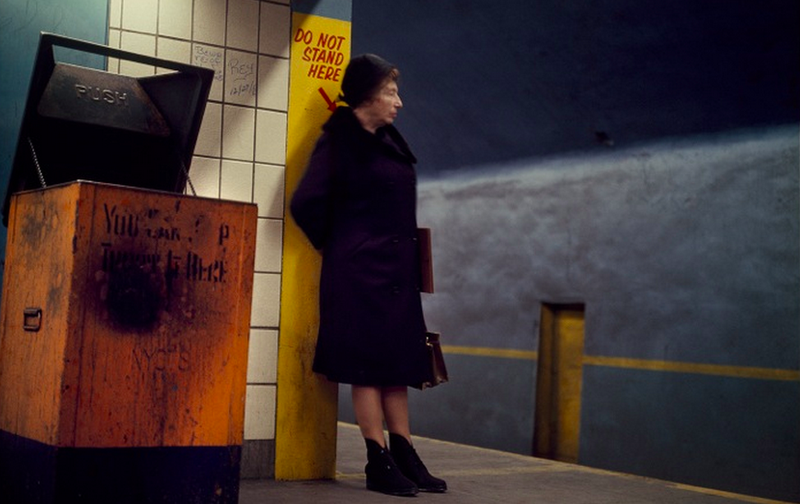 So the subway captured in these remarkable images by photographer Danny Lyon in 1966 feels almost contemporary—which is what makes it shocking that they were shot 48 years ago. You probably know Brooklyn-born Lyon from other projects—as one of the most influential photographers of the 1960s and 70s, he embedded himself in cultures and movements to capture candid, revealing images of everything from the motorcycle gangs of the 1960s Midwest to the rapidly changing face of lower Manhattan, where in the 1960s, Lyon created some of the few remaining photos of what the city looked like before it was largely demolished to make way for the lower Manhattan we know today, publishing his images in a book called The Destruction of Lower Manhattan. Lyon returned to New York City in late 1966, when he took his mother's advice: "If you're bored, just talk to someone on the subway." And so he did. The following images were shot in 1966, but have never been publicly exhibited. Our impressions of the past are deeply influenced by the technology that recorded whatever remains from it—think of the spooky formalism of 19th century daguerreotypes, or the crisp austerity of 1930s portraits. So when we're presented with photos of a particular era that look like they were captured with anachronistic technology—say, seeing polaroids of the 1870s—it's naturally a shock to our brains. That's definitely the case with Lyon's subway portraits, which though they weren't captured with particularly nascent tech (Lyon used a medium format Rolleiflex and Kodak color film) have an incredibly contemporary feel to them. The subjects, the colors, the atmosphere; it all feels as though it could have been shot yesterday—and not just because they look like they were run through Instagram. They're fantastic photos, and you can check them out in their entirety for the next year at the the Atlantic Av-Barclays Ctr BDNQR2345 station. All images by Danny Lyon, courtesy Edwynn Houk Gallery, New York / Zürich.